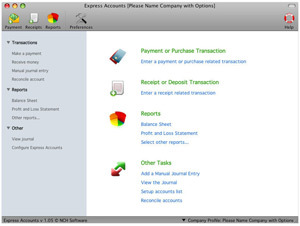 xpress Accounts Mac OS X Accounting Software Free from NCH Software. Express Accounts Accounting Software is perfect for small businesses. Easily track payments and deposit transactions. View balances and reports to see how your business is doing. Email or fax reports directly to your accountant. This software is designed to be intuitive and very easy to use. Organize your business' bookkeeping by tracking sales and accounts receivable. You can also automatically record recurring orders and invoices.